If you’ve ever wished someone “Mazel tov!” you’ve invoked Judaism’s mystical tradition, specifically its association with astrology. “Mazel tov” means “a good constellation.” This probably surprises a lot of people, since there’s a general understanding that Judaism avoids astrology. After all, a Biblical commandment states “There should not be found among you…one who calculates times” (Deuteronomy 18:10). And Leviticus includes the injunction “Do not act on the basis of auspicious times” (Leviticus 19:26). 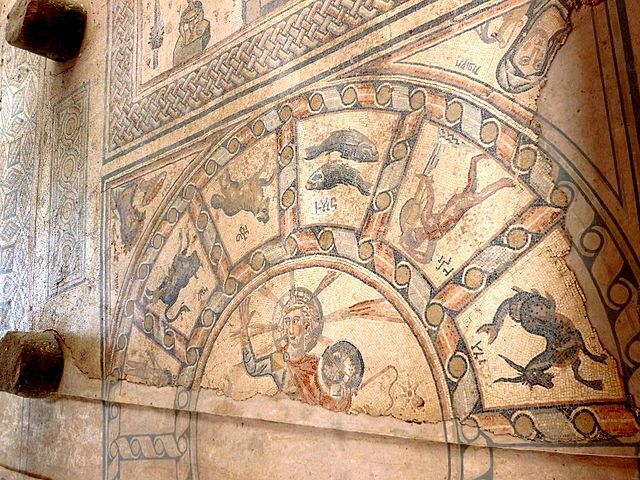 Yet, we find the signs of the zodiac –the fish for Pisces, the water-bearer for Aquarius, scales for Libra, and the others– used unabashedly as decorative elements in mosaic floors of ancient synagogues. 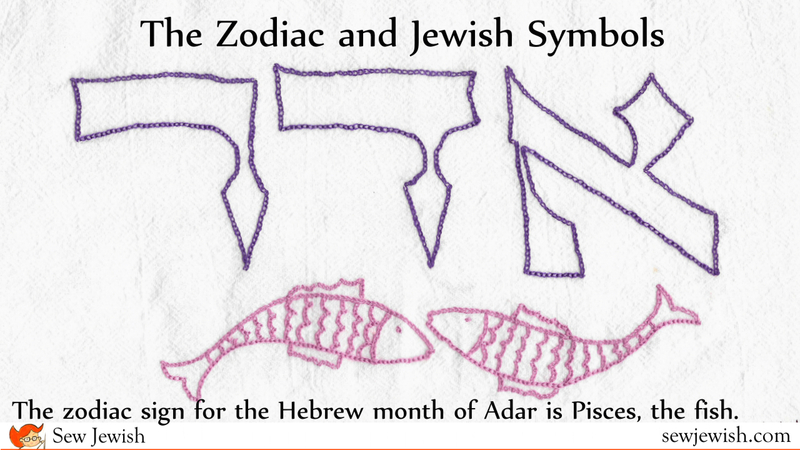 And, of special note to those of us interested in Jewish needle crafts, we see signs of the zodiac used to decorate embroidered Torah binders for hundreds of years in Eastern Europe and Italy. 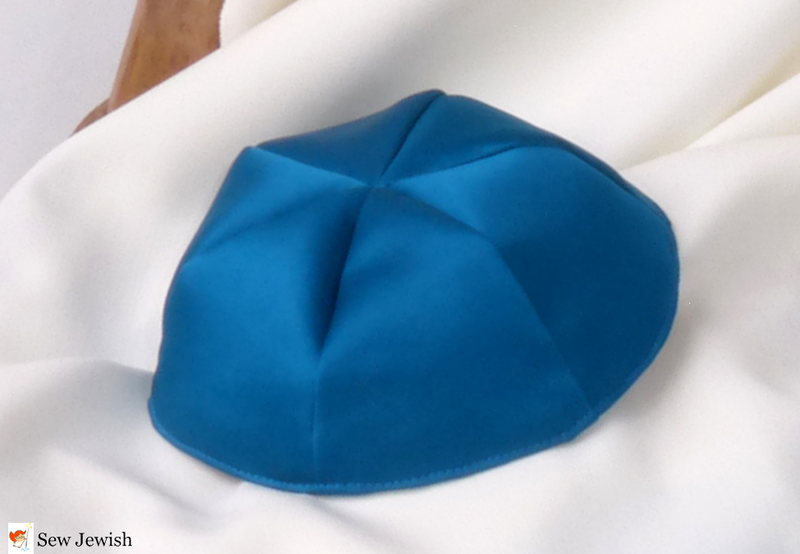 From the seventeenth century into the Twentieth century, a time span of more than three hundred years, it was the custom in these communities for a new mother to commemorate the birth of a son by making a Torah binder, also known as a wimple. On the binder, the mother embroidered the son’s name and date of birth, typically illustrating the name of the birth month with the associated astrological sign. These binders came in direct contact with Jewish communities’ most sacred objects, the Torah scrolls, and the rabbinic leaders of these communities allowed it. This gives an indication of the acceptance of some form of astrological practice, and of the use of astrological symbols as decorative elements, even among rabbinical leaders. But wait, the ancient rabbis didn’t really believe in astrology, did they? What’s going on? The bridge between the seemingly plain meaning of the Biblical injunction against practicing astrology and the use of astrological signs in sacred Jewish spaces comes through Judaism’s mystical tradition, Kabbalah. Kabbalah posits a system whereby God exerts influence over our lives through angels associated with the planets. You can find a detailed, authoritative examination of a number of ancient Kabbalistic astrological teachings in Aryeh Kaplan’s translation and commentary on the Sefer Yetzirah. The Sefer Yetzirah,the first Kabbalistic text, seems to have existed at least as early as the first century . Of God and the constellations, the Sefer Yetzirah says, “He made them like a trough” (6:3), meaning that the constellations channel spiritual energy to the physical realm. Noted Jewish scholars have held different opinions on the validity of astrology –Maimonides, for example, claimed that astrology isn’t valid, and Jews shouldn’t practice it; Nachmanides said it’s valid, but we still shouldn’t practice it. Whether astrology works or not, why did the rabbis in some communities permit depictions of astrological signs? Getting back to the Sefer Yetzirah, Kaplan writes in his commentary that the Biblical prohibition on calculating auspicious times means only “that one should not make astrology a dominant influence in one’s daily life.” According to a number of prominent commentators, practices intended to enhance personal traits such as wisdom and peace, for example, are permitted, according to Kaplan. “As we see from all the commentaries on Sefer Yetzirah,” Kaplan writes, “when one is engaged in these mystical techniques, this prohibition [on calculating astrologically auspicious times] is not applicable.” These commentaries, and similar commentaries on other major mystical works, would be the teachings that Jewish communities relied on when employing the signs of the zodiac as design motifs, even in sacred spaces. I should throw in a couple of important points here: The Kabbalists’ conception of astrology differs from other schools of astrological thought in critical ways. For one, Kabbalah recognizes that God, not the planets and stars, is in charge of the universe. In this system, the planets are mechanisms through which God exerts influence in the physical world. Also, Kabbalah teaches that although astrological forces influence our fate, they don’t determine our fate. Whatever future might be suggested by astrological elements, the Kabbalists teach, we can change our fate through prayer, charity and repentance. It’s also important to note that in the applications we’ve talked about, synagogue floors and Torah binders, the signs of the zodiac were employed as decorations, like painted figures in illuminated Jewish manuscripts. Creating the symbols as objects of worship or as the focal point of meditation would not be permissible under Jewish law. Each month’s symbol connects to Jewish calendar. For example, Tishrei’s symbol, the scales, reflects Yom Kippur’s theme of judgement. During Kislev, whose symbol is the archer, we celebrate Hanukkah and the Maccabees’ victory in retaking the Temple. Av is the month during which both Temples were destroyed, once by Babylon and once by Rome. Leo, the lion, represents these powerful forces. Now, we often see some of these symbols as Jewish motifs when they have no association at all with the zodiac. The vast majority of lions depicted in Judaica, for example, do not represent the sign of Leo. Most represent the Israelite tribe of Judah, an association made by the Biblical patriarch Jacob as he blessed Judah and his other sons at the end of his life (Genesis 49:9). The fish, the astrological symbol for Pisces, has its own separate meaning as a Jewish symbol of good luck. In fact, fish are one of my favorite Jewish design motifs, so I’m going to make that the subject of one of my next posts. Update: Here’s the post about fish as a Jewish symbol. Tags: Jewish astrology, Jewish good luck symbols, Kabbalah, Kislev, Leo, signs of the zodiac, Tishrei, Torah binders, wimples. Bookmark the permalink. 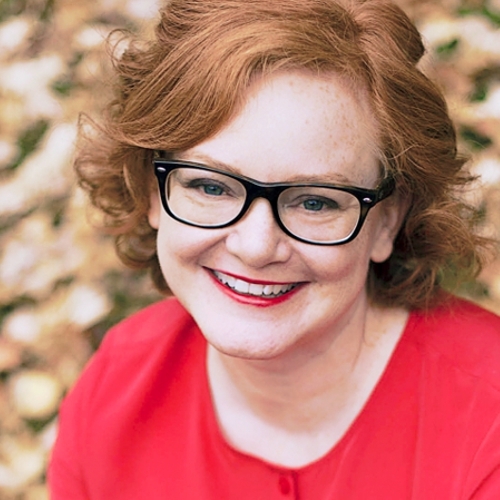 Thank you, Maria, for another interesting article. Yes, I admit, I’ve known about the zodiac and the fish before, but I love the way you put the information together. Thanks, Barbara. I’m glad you found the post interesting. 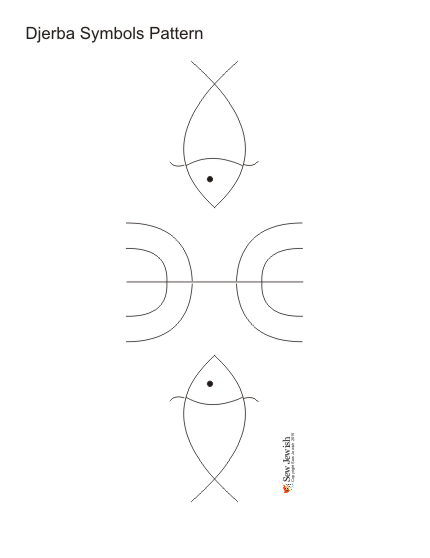 There are so many Jewish symbols to explore, and I especially love folk symbols like the fish. I’ll have to do more posts on the subject, I think. Thanks for writing. Thanks for this very well-written article, Maria. If you are not familiar with it, there is an excellent book on Hebrew astrology by Matityahu Glazerson called ‘Above The Zodiac: Astrology in Jewish Thought'(Jason Aronson, 1997) It has been one of my references for my own work as I have included Hebrew zodiac imagery in a number ketubot and in the section on Parashat Emor in my book, (Between Heaven & Earth: An Illuminated Torah Commentary (Pomegranate, 2009). Thank you for writing about these resources, Ilene. I’ve always felt that there is a strong connection between the illuminations in Jewish manuscripts and the needle work that embellishes Jewish ritual items. I’ve often been inspired by illuminated manuscripts. I’m looking forward to taking a look at your book.